LEGO Universe will launch in October in the US and Europe. 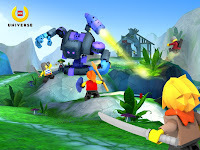 The family-friendly MMO will be in stores on 26th October, but the game will be made available early, from 12th October, through LEGO stores, the LEGO Online Shop and LEGOLand. NetDevil is the developer of LEGO Universe. Previously they created Jumpgate and Auto Assault.